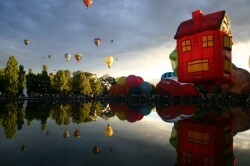 The Canberra Balloon Spectacular is almost here again. It starts on Saturday 9March and runs for nine days until Sunday 17 March 2019. Balloons meet each morning in front of Old Parliament House. Bookings can be made by phoning Dawn Drifters on 02 6248 8200, places are limited. All flights include champagne and a cooked country-style breakfast. 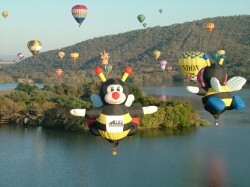 "I just had to send you an email and tell you how much we all enjoyed the balloon ride on Wednesday morning.? All the staff were great and the Vincent was a fabulous pilot! Thank you for everything. The flight was fantastic, and we're looking forward for doing it again soon."